Hi my name is Natasha and I love this book. But seriously, I do. And I wish I heard about Diana Wynn Jones way sooner because this lady is my bread, my peanut butter, and my jam. 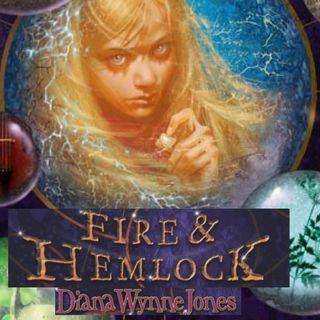 So thanks so much to Patricia Bing-Grant for commissioning Fire & Hemlock. I'm finally starting to put a few things together this episode, although I'm so belated on a lot of it that it's almost embarrassing. It takes me until nearly the end of the episode to realize that the painting of the sad ... See More clown is related to Polly playing Pierotte in the school play, and it didn't even occur to me that the pendant her Gramma gave her was of any significance. I am still constantly surprised, though, that Jones is able to get across such subtlety of character and such emotional issues in the context of this children's story. Good lord, it keeps catching me by surprise. Thanks so much for listening! See you soon with a new episode!